Aside from utilising CFDs for speculative gains, contracts for difference can also be used as a powerful risk protection tool for those who understand the power behind this simple investment product. Hedging is the action of taking an equal but opposite position usually through a derivative; such as a contract for difference in order to mitigate or reduce the risk of an existing open position. In fact, a number of traders also utilise CFDs as part of a hedging strategy to help protect existing positions and their shares portfolio. A hedge will create neutral market exposure so any price changes will be off set by opposing positions. Since a contract for difference is a geared product its leverage serves to protect the total value of a stock position without you having to pay much upfront for it. CFDs are also sometimes used to trade the short-term price movement of the stocks within their portfolio without needing to sell the stocks and realize any capital gains. It’s important to understand that any time you hedge your financial position, you are accepting that you may lose some potential profit. There is always a trade-off, and hedging is like an insurance policy — in fact, in the broadest sense taking out insurance is an act of hedging. So there is a price to pay in terms of lost profits, but hedging properly implemented will avoid you having to take large losses. A hedge allows a trader to offset any losses in a long position with profits from an opposite short position. If you have a portfolio of shares, and you are concerned that a market downturn is imminent, you may wish to hedge against this event. To avoid losses, quite simply you could sell your shares, wait while the value drops, and then possibly buy them again at a lower price. But this would be speculating on the market fall, a separate exercise, rather than hedging your portfolio. After all, the market may not turn down. The other disadvantage to this course, as mentioned above, is that selling your shares would realize capital gains. If the price of the shares did not move, and you bought them back, you would still have to pay capital gains tax at the end of the year without having any profit in hand to meet that. To hedge your position and protect yourself against losses you can instead take out short positions with contracts for difference that match your shareholding. Now if the shares drop in value your original portfolio becomes worth less, but the CFDs gain by the amount the shares have dropped, neutralizing your loss. Most investors and traders who are just starting out look to generate short term gains using contracts for difference and like to take advantage of the powerful leverage that CFDs allow. There is also a group of investors who love the simplicity of using CFDs as a risk protection strategy on their existing portfolios. This is because with a CFD, a short position a short position can be made to hedge the exact position size required. For example, a popular trading strategy, and a useful one in turbulent times, uses a hedge to protect a single share position with a CFD. Imagine, for example, that you hold physical shares in a company and feel that its share price is vulnerable in the short term, but you still want to stay invested in the stock over the long run, say, for the dividend yield. If you hold 5000 shares of the company, you would be able to hedge the risks through CFDs by short selling 5000 shares CFDs to account for the risk exposure for that particular investment in equity. 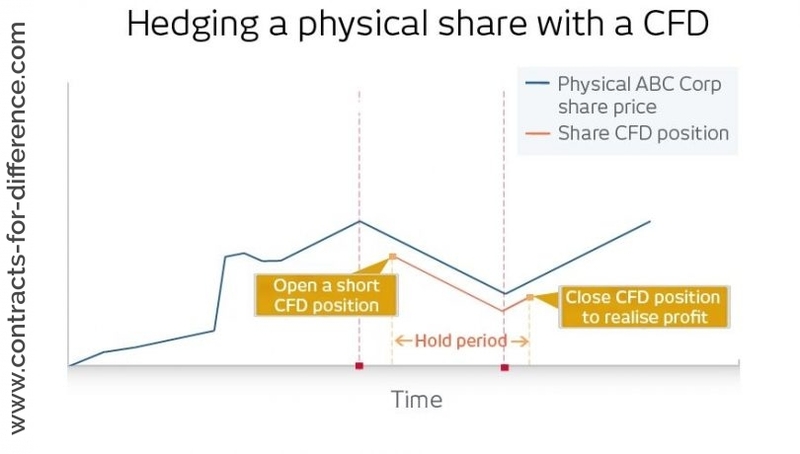 If this hedge is correct, you will be able to buy your short CFD position at a lower price level and the profit achieved on your CFD will offset the paper loss on your physical shareholding. If the shares do not change in value, then neither do your CFDs. You can buy back the CFDs you sold to hedge the position. If the shares increase in value, then your gains on the portfolio are offset by the losses on the CFDs – this is where you lose your potential profit – but at least the value of your portfolio is protected which was the original intent. In addition, since CFDs are traded on margin, a big movement in a relatively large long-term share holding can be covered with a far smaller deposit outlay in a CFD. A lot of UK investors will have long-term holdings in BP and Shell. They may be reluctant to sell their shares, but are concerned that the oil price may adversely affect the valuation of their holdings. One way investors can protect themselves from further falls would be to ‘hedge’ their holding using a CFD. By taking an equal and opposite ‘short’ position in BP or Shell using a CFD, they could become hedged. For example, if the share price of Shell continues to fall, then what an investor loses on the shares, they gain on the CFD. This strategy could be used while the oil price is continuing to fall. Once the situation improves, then the hedge could be closed out. During the euro crisis more and more investors started looking to short the MIB Index (Italy), the CAC (France), the IBEX (Spain) and the US indices to protect their portfolio. Or they expressed their bearishness by going long (buying) gold – as a direct effect gold has been making higher highs and lower lows, it’s at record levels in many currencies – or in the currencies. Hedging does not necessarily need to involve offsetting two positions in the same market as you do when you hedge a single share position by offsetting it with a contract for difference – you can also hedge by diversifying your investments. Let’s suppose that you are foreseeing a period of extended volatility in share markets but do not want to sell out of your portfolio for tax reasons or simply because unwinding a sizable shares portfolio involves expense and hassle. If you have a substantial portfolio, then instead of selling CFDs for each individual shareholding you could consider selling index CFDs, which reflect the whole market. In such a scenario, you could go short on one of the major equity indices, such as the FTSE All-Share, so that you will make a gain on the CFD if the market falls to compensate for any losses on your underlying shares portfolio. This would not give such an exact match to your portfolio, depending on its constituents, but could provide a measure of hedging against an economic downturn. You would need to consider which index best reflected your portfolio’s performance, and perhaps compromise on the actual amount. This trading strategy works particularly well when you believe that shares in general are set to fall. You sell an index-tracking CFD and gain from the fall you expected in the overall market. Irrespective of whether you believe that shares are set to rise or fall, you can cover yourself against the unexpected by buying or selling an index or sector CFD. 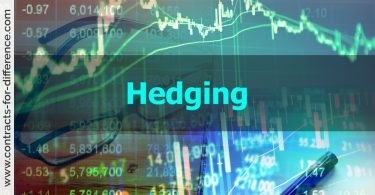 While you would need to do the numbers to see exactly how well your portfolio was hedged by the above method to avoid any losses — by which I mean there may be commissions, spreads, and fees associated with trading these CFDs — an incidental benefit of this hedging technique is that CFDs pay interest every day while you are in a short position. While it may not amount to much, such interest would help to offset any trading costs. Another common hedging strategy involves buying one company’s CFD while simultaneously selling a rival company’s CFD. This is referred to as pairs trading as it involves trading a pair of CFDs.